MADRID, N.M. -- Main Street consists of two rows of old, shaky-looking, single-story, wooden buildings set along the half-mile between two right-angle bends in New Mexico Highway 14, as it winds its way up through the scrubby foothills of the mineral-rich Ortiz Mountains. Giant mounds of mine rubble and tailings are still the largest structures in town. It is an unlikely setting for a thriving arts and crafts community, although not perhaps for "Wild Hogs," a Hollywood movie about midlife crisis and self-discovery. Madrid (pronounced MAD rid), N.M., owes its existence to coal. Situated about 20 miles south of Santa Fe, it was a site for mining coal as early as 1832, when its anthracite and bituminous deposits were used to smelt gold ore at nearby Dolores. It is one of a few places in the world where both hard and soft coal are found together. In 1892, when tracks for the Santa Fe Railroad were laid down six miles to the north, the yield from the narrow valley then known as Coal Gulch was large enough to warrant the construction of a spur to the mainline. Wooden cabins were brought from Kansas to house miners and their families. By 1919, the company town known as Madrid could claim 3,000 residents, more than either Santa Fe or Albuquerque. That year, Oscar Huber was hired as superintendent of the mine. 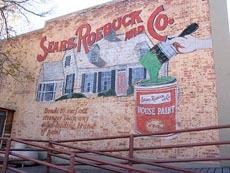 Under Mr. Huber's management over the next three decades, Madrid became both a model mine and company town. It had an elementary school, a high school, a fully equipped hospital, a company store and an employees club that required miners to donate between 50 cents and a dollar per month for community causes, such as the annual Fourth of July celebrations. The town's baseball team, the Madrid Miners, in the Brooklyn Dodgers farm system, played on the first illuminated diamond west of the Mississippi. And each Christmas, Madrid was decked out with a display of 150,000 decorative lights so dazzling that airline pilots made detours so their passengers could marvel at the desert extravaganza. After World War II, however, when railroads switched from coal to diesel power and natural gas began being piped into homes and factories around the country, the mines at Madrid went into decline. In an effort to perpetuate the operations, Mr. Huber purchased the mine and town, but to no avail. In 1954, the coal company ceased operations; the main shafts were sealed. The miners and their families drifted away, and Madrid became a ghost town. In the early 1970s, Mr. Huber's son Joe began trying to rent or sell some of the miners' cabins to rugged individualists, artists and craftspeople and others simply looking for an inexpensive place to get away from it all. And inexpensive it was. Some cabins reportedly were purchased for as little as $10, a bargain even if water had to be trucked into town. Since then Madrid has grown to become sort of a real-life version of Cicely, Alaska, the funky, fictional hamlet featured in the 1990s TV series "Northern Exposure." New construction has been modest, but its 400 residents have slowly restored many of the town's old buildings. Though by no means gentrified, Madrid has gained a degree of respectability. The general store in Madrid, N.M., features a scrap metal statue of a fanciful Western troubadour crafted by Michael Austin Wright. Many of the wooden company cabins have been inhabited and gussied up. Most of Main Street's store fronts are now occupied by more than two dozen small craft shops and boutiques, selling locally produced art, crafts, curios and jewelry, with lots of silver, turquoise and crystal. The Miners Amusement Hall, the old Catholic Church and the Coal Mining Museum have been rescued from dereliction. Several small B&Bs have opened, and property values in Madrid have increased significantly. And since 1982, the Mine Shaft Tavern has been open for business. Known for having New Mexico's longest wooden bar, this saloon became a popular oasis for motorcycle riders tooling along Route 14, which six years ago was branded as "The Turquoise Trail" and designated a National Scenic Highway. These days, weekends in Madrid can be quite a scene, a melange of hikers and bikers, both those clad in leather and Lycra, horseback riders, ATVers, art seekers, scenery-gawking tourists and eclectic locals all milling around Main Street, which has no sidewalks. The town has also revived the Fourth of July Festival, as well as a subdued version of the annual Christmas light festivities. Maybe the Mine Shaft Tavern was the original inspiration for Disney Touchstone Pictures' choice of Madrid as the setting for "Wild Hogs." Or maybe it was the town's counter-culture reputation as a good karma kind of place. New Mexico's aggressive 25 percent tax rebate and loan program for film production certainly didn't hurt. At any rate, for six weeks last summer all of Madrid's Main Street was transformed into a set for the light-hearted comedy, which features Tim Allen, Martin Lawrence, William H. Macy and John Travolta as weekend motorcycle buddies from Cincinnati who take off on a cross-country ride to rediscover their lost youth. Somehow the quartet end up in Madrid, where they encounter Ray Liotta, the menacing leader of the Del Fuegos, a gang of motorcycle baddies, and Marisa Tomei, the doe-eyed proprietor of Maggie's Main Street Diner. Without giving away the movie's ending, the action culminates in a showdown between the Wild Hogs and the motorcycle gang during Madrid's colorful, but fictional Chili Festival. Many of those scenes were shot on site using the town's humble architecture as a backdrop and many of its riotous residents as extras. Film crews even constructed Maggie's Main Street Diner on an empty lot on Main Street. Michael Austin Wright and Joyce Roetter are an affable, artistic couple who arrived in Madrid from California 14 years ago and have transformed the old mine's winch house into a cozy cottage with an attached casita for guests. Mr. Wright, a sculptor who among other projects fashions large fanciful Western figures out of scrap metal, helped negotiate with the movie people on Madrid's behalf. "It was a huge disruption and a lot of traffic," he recalled. "Although the movie crew built a bypass road, the highway was shut completely several times a day for 15 or 20 minutes at a time." But he noted that Madrid also benefited from the production. "The town board got $45,000. The ballfield was leased for two months and turned into a trailer park for the crew. Other people rented out their places during the filming." When the production was finished and all the stars and glitter had gone, life in Madrid returned to normal, such as normal is. The only evidence remaining from the filming is the small green building, built as the diner. Although only an empty shell, it's already attracting a lot of attention since the movie was released. There's been a surge in visitors, and Mr. Wright estimates a quarter of them have come because of "Wild Hogs." If you go: Madrid, N.M.